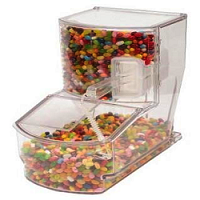 Candy Concepts offers a comprehensive line of acrylic display bins, candy boxes for party favors, and storage container boxes for your bulk foods display options. 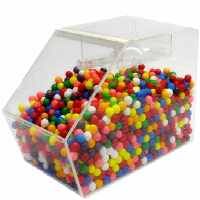 Acrylic containers are necessary for dispensing unwrapped candy and bulk food products among other important retail materials. Read More..
Acrylic storage bins and containers have the appeal of glass and is sturdier than some plastic containers. 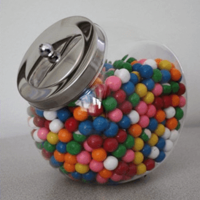 Clear storage boxes can create a nice clean line adding to eye appeal as well as providing a completely unhindered view of the candy contained within. Sort your products with these acrylic organizers for a neat and orderly line-up of sweet treats and other types of materials. 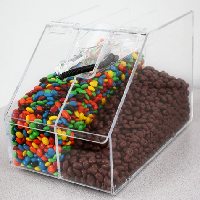 Keep your merchandise arranged by color, design, or flavor using our storage acrylic bins and acrylic drawers. 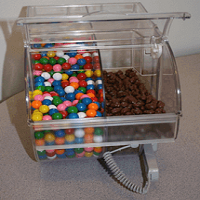 Many Health Departments require acrylic candy bins to sell unwrapped candy, bulk candy dispensers are top notch for holding all those candies. 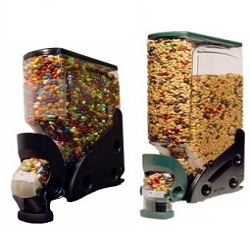 Select from a large variety of scoop bins, divided bins, candy jars, and stack-able drawers. With all the available options for your candy shop you can choose whichever best fits your unique needs. 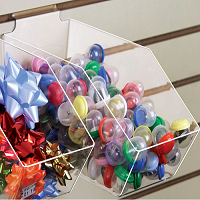 If you are in the mood for something a little different for your store and want to maximize space, we have adapted slat-wall containers available. 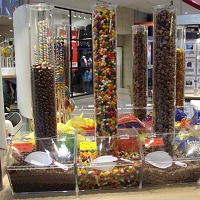 Whether you have space for a large candy display or a small sectional area, we have the products to get you started. 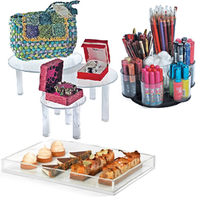 Acrylic bins and storage containers offer optimal view of the merchandise displayed within. Just like our make-up organizer, your resale merchandise will appear neat, organized and easy to obtain the product with no hassle. 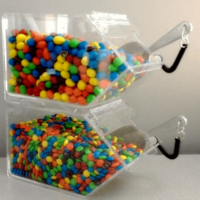 If you are catering a party and need designer table risers for your food dishes or candy scoop bins and gravity candy bins to slat wall containers, we have the right retail fixture for you. Add a little simplicity with an upscale appeal to your store or specialty shop. Its free to take a look at our products, order your clear storage containers today.